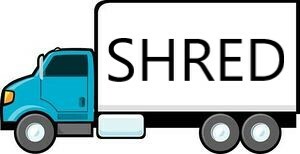 All items shredded on-site inside the truck! Please see flyer here for details! In anticipation of new construction, there will be changes to our pick-up/drop-off procedures as well as parking. These changes take effect on 11/26/18. 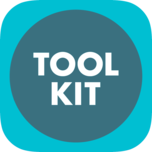 For a diagram and more information, click here. 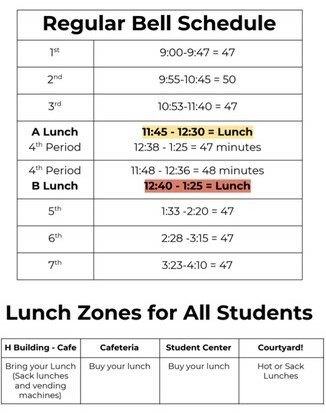 Due to construction, there are now 2 lunch periods instead of 3. See new schedule here. Fresh Fruit Friday has been a great success! Please help keep it going! Volunteers are needed on Thursday and Friday every week for about an hour. Please see the sign-up here. "Fresh Fruit Fridays" began rolling out to students the week after Thanksgiving, with PTA volunteers inviting students to enjoy a free apple, banana or orange on their way into school in the morning. There is also a clothes closet on campus to help meet the needs of students on-site. Formerly called The CLAW, the Wildcat Den is currently fully stocked with clothing and food, thanks to the generosity of the staff and community. There's a new resource being set up to help kids at LHHS that are in need and/or homeless. The school counselors, PTA Community Outreach, and Communities In Schools are combining efforts to stock a food pantry and clothes closet. This is located in the H building in what was formerly the nurse's area. This is separate from the RISD Clothes Closet. This Drop-In Center is for the students on the LHHS campus. When a student comes to the counselor and needs something to eat, or needs some clean clothes right now, the counselor will be able to help that student immediately. We now have a designated spot, a small storage room in the H Building, to consolidate food and clothing donations. We are looking for clothing donations of jeans, sweatpants, leggings, tops, jackets, new socks, new underwear, new sneakers, etc. We can even take LHHS/Lake Highlands t-shirts and spirit wear. Just make sure it's CLEAN, school appropriate, and it's in good enough condition that you would let your kid wear it. Please bring your donations to the counselor's office in the H building and make sure it is clearly marked as a donation for the Drop-In Center. The PTA still needs 75 more $5-$10 gift cards to be used by our principal, Dr. Delich, throughout the school year to reward faculty and teachers. You can buy them or donate one you might not need or use. Please leave the cards at the front office of the "L" building under the name of Kiersten Stockham or Sherry Hicks. Thank you! The RISD Clothes Closet needs gently-worn coats in any size (but especially teen and adult sizes for boys and women's L and XL). They always need clothing (shirts, pants, etc.) in good condition, in style and age-appropriate. Donations can be dropped off in the front office of the H bldg, or at the RISD Clothes Closet on Mondays (school days only) from 9:30 am - noon at 1239 W. Beltline, across from Richardson HS. It's always a good time to to give to Wild for Cats, especially if you haven't given yet this school year! See flyer with more information here and donate here. Also, save the date for a community event on January 31! Mom’s Corner offers a wonderful opportunity for parents to be hands-on in the high school. One day a month (or more if you would like) you will help the cafeteria staff in the snack bar. The snack bar is located in the student center (down the hall on the left from the library). Sign up for the day of the month you would like to work throughout the school year. 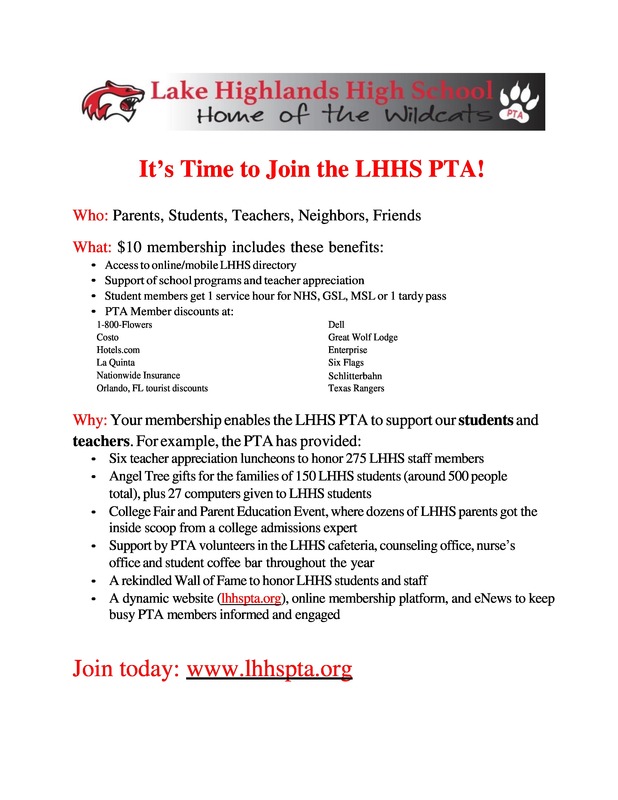 Join the LHHS PTA! Memberships are only $10! Please see more details on why to join here. Purchase your student's yearbook and/or Senior ad directly through Balfour! Here is a link to the LH yearbook page. The base price is $65. There is a personalized package for $80 that includes 1 line of name stamping and two icons OR parents and students can add up to 3 lines of name personalization and up to 4 icons for $5 each. When prompted to put name and address for shipping, put Lake Highlands High School, 9449 Church Rd., Dallas 75238. Yearbooks are $65 if ordered by Feb. 1, 2019. After that they increase to $70. The final deadline to order is April 5. Ads MUST be bought by Friday, Nov. 16. The Wall of Fame is a great way to show your support and display a permanent memory of your graduate, past and future students, family, teacher, club, staff or friend. 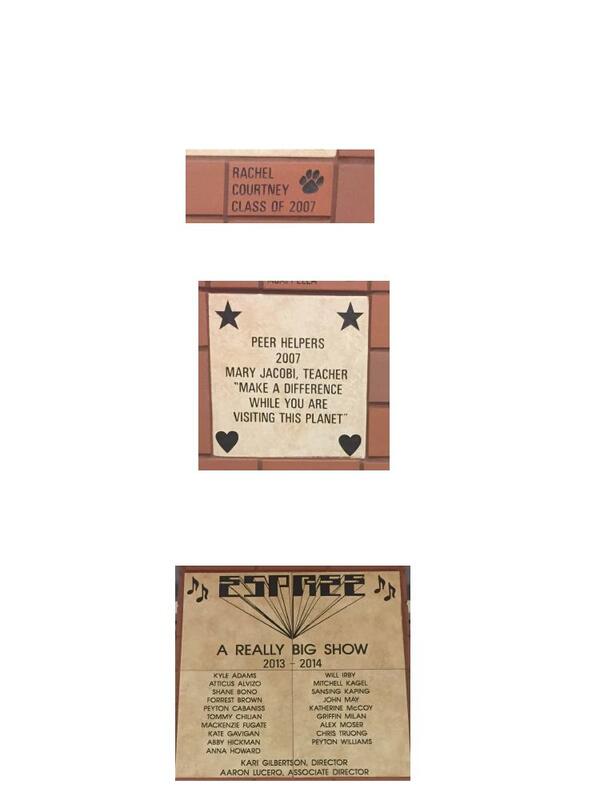 The last day for Wall of Fame bricks and tile orders is April 30, 2019. Click on the links for an order form for the 4x8 bricks or 12x12 tiles, an order form for the 24x24 tiles, an Example sheet and a Logo Choices sheet. The online payment option is on the Wall of Fame page. Questions? Email Kathleen Elliott at kawelliott@gmail.com. 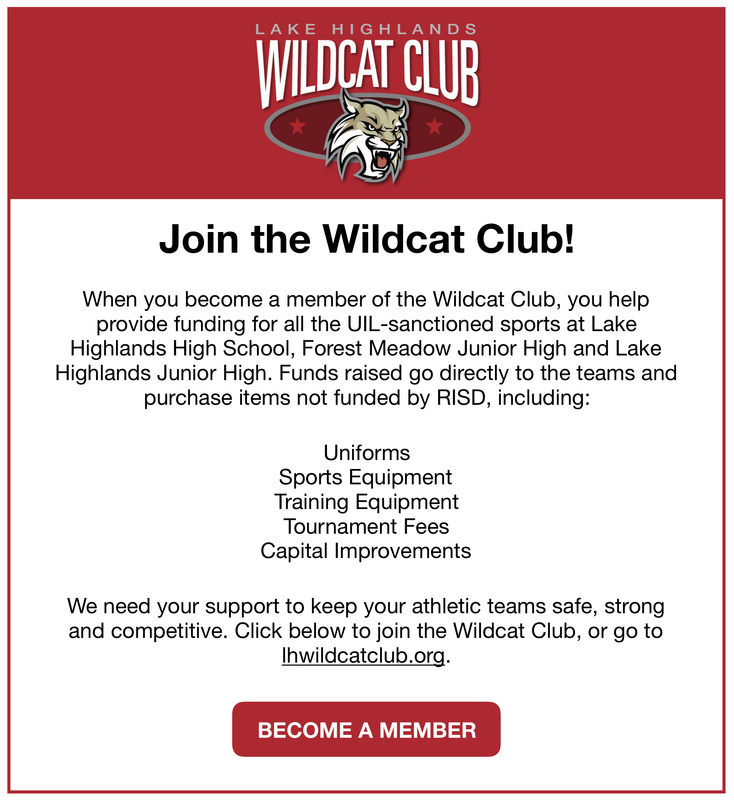 See information here on how to support sports at LHHS, LHJH and FMJH! 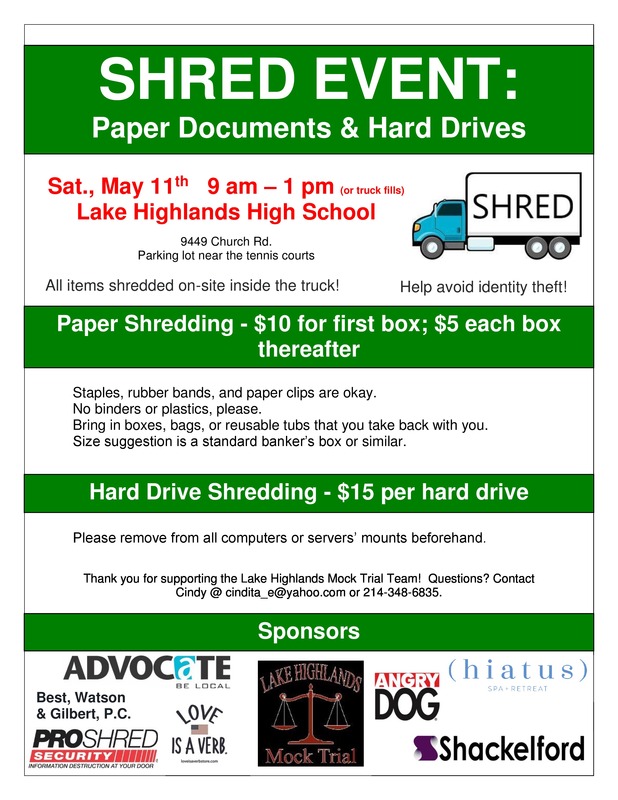 LHHS has many great opportunities to get involved! There is something for everyone. See list of clubs and organizations here. If you missed the community meeting last week regarding construction beginning at LHHS this winter break, here is the presentation. PTA members only will receive automatic updates about student calendars.